In recognition of being the greatest college basketball player since their founding in 1946, Sport Magazine named Robertson College Basketball’s Top Performer of the publication’s 15 years of existence. The honor came complete with this imposing trophy measuring almost 30 inches tall and weighing nine pounds. A silvered figure holding a victory wreath aloft is mounted on a golden urn and 6.5” by 11.5” wooden base, flanked by two additional triumphantly posed silvered figurines. 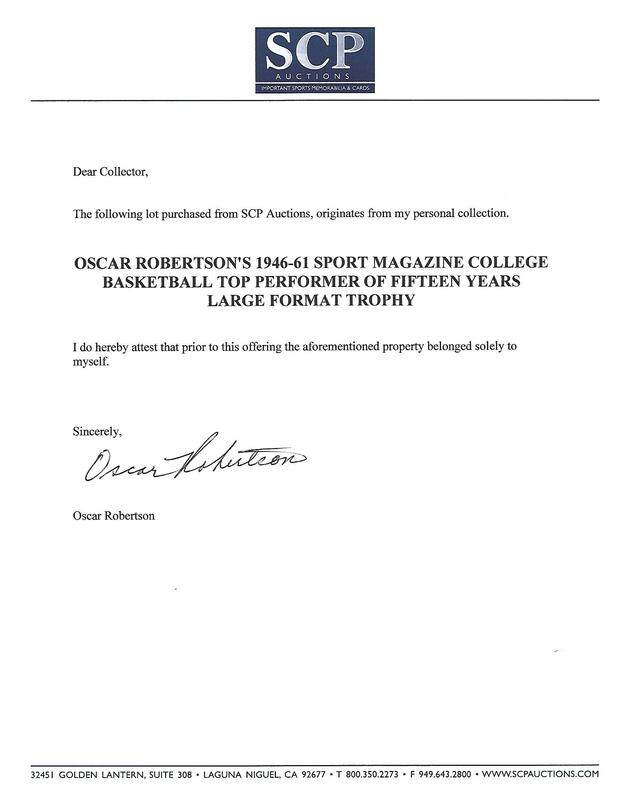 A gold placard along the base reads, “SPORT MAGAZINE FIFTEENTH ANNIVERSARY AWARD” and the larger center-mounted plaque proclaims, “Presented To OSCAR ROBERTSON 1946-1961 COLLEGE BASKETBALL TOP PERFORMER Of THE FIFTEEN YEARS.” The trophy shows some light wear from display and age, with some minimal edge scuffing and tarnishing to the metal fittings. An impressive award presented to Oscar Robertson as the professional era of his Hall of Fame career was getting started. Includes LOA from Oscar Robertson.